Just about everyone has heard of Esperanto, which was nothing less than one man’s attempt to bring about world peace by means of linguistic solidarity. And every Star Trek fan knows about Klingon, which was nothing more than a television show’s attempt to create a tough-sounding language befitting a warrior race with ridged foreheads. But few people have heard of Babm, Blissymbolics, and the nearly nine hundred other invented languages that represent the hard work, high hopes, and full-blown delusions of so many misguided souls over the centuries. 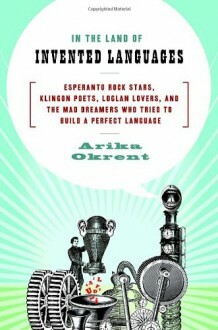 In In The Land of Invented Languages, author Arika Okrent tells the fascinating and highly entertaining history of man’s enduring quest to build a better language. Peopled with charming eccentrics and exasperating megalomaniacs, the land of invented languages is a place where you can recite the Lord’s Prayer in John Wilkins’s Philosophical Language, say your wedding vows in Loglan, and read Alice's Adventures in Wonderland in Lojban. A truly original new addition to the booming category of language books, In The Land of Invented Languages will be a must-have on the shelves of all word freaks, grammar geeks, and plain old language lovers.